Young Gifted and Black: Twerk Flyer- Dr. King's daughter Bernice King: "We've failed to reach these groups of People"
Twerk Flyer- Dr. King's daughter Bernice King: "We've failed to reach these groups of People"
Now, our question, can't she stop them from using her father's image? Or No? I mean these ingrates do this every year around this time..They should really be ashamed of themselves, I reposted this flyer to show the ignorance of how black folk can be their OWN worst enemy at times. On Monday Your Black World reported on promotional fliers being passed around social media with the image of Dr. Martin Luther King Jr. wearing a large gold medallion and gold watch, throwing up what could be gang signs, with the headline,“Freedom 2 Twerk.” Although many people have expressed outrage over the fliers since then, none are more enraged than Dr. King’s daughter, Bernice King. 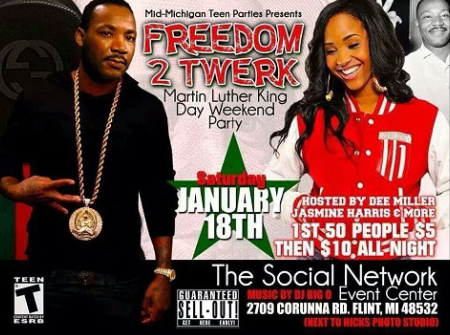 The fliers were apparently being circulated to promote a “twerking” party in Michigan, but Ms. King says the fliers fly in the face of her father’s legacy. I feel like we have failed to reach these (groups),” Dr. Bernice King told FOX 5′s Deidra Dukes in an interview. ust appalling, and it’s almost embarrassing,” Dr. King explained. “For me, as his daughter, it’s like ‘wow’, I lost a father who sacrificed everything for them to live a much more dignified and respectful life, and for it to come to this makes me sad,” King said. Dr. King said she doesn’t take issue with people who choose to celebrate her father’s life, but says she does have a problem with the fliers because they seem to suggest that her father would have approved of this sort of lifestyle. “My father would have worked to elevate them, to connect with them, and bring them into the movement,” King observed. The unidentified man who reportedly helped with market for the event says ‘no disrespect’ was intended.